We’ve been very busy around here since my last post. One entire season has come and gone and we’re well into Fall. It’s been exciting coming up with new ideas for the Holiday’s this year and I think we’ve come up with two definite winners. This is an All Natural Wool Nesting Ball. 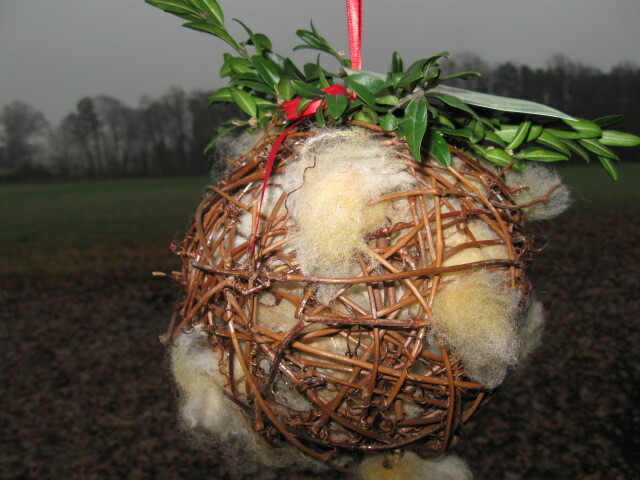 It’s a grapevine ball filled with sheep wool. You hang it in a tree or on your deck and birds come a pull small pieces out to aid in nest building. It’s a great gift to give to the bird lovers on your gift list or to give to yourself. 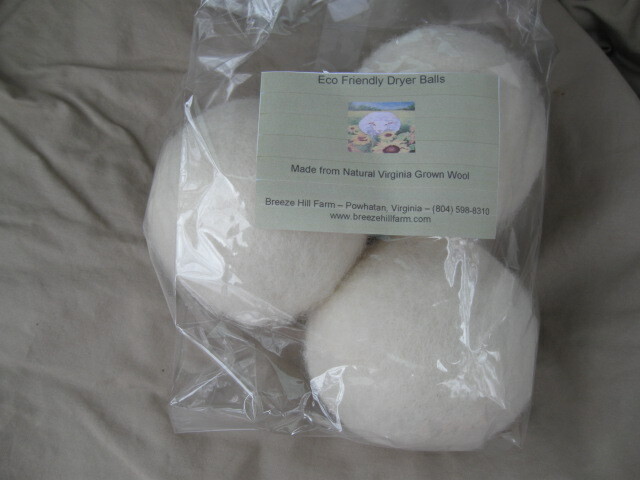 Our other new item from the farm are our Eco Friendly Dryer Balls. These are made from 100% all natural wool from our sheep. These are just great..they do the same job as a dryer sheet without all those nasty chemicals and with wool being able to absorb over 60% of their weight in water..using these dryer balls reduce your dry time which equates to less electricity use. So as you see, we really have been busy putting together items that will make nice gifts for others or for you. Who knows, before Christmas we might just come up with some other all natural farm gifts! It’s Been A Long Time Again! It’s coming down to the end of Spring around here. Let me update you on what has been going on at the farm. 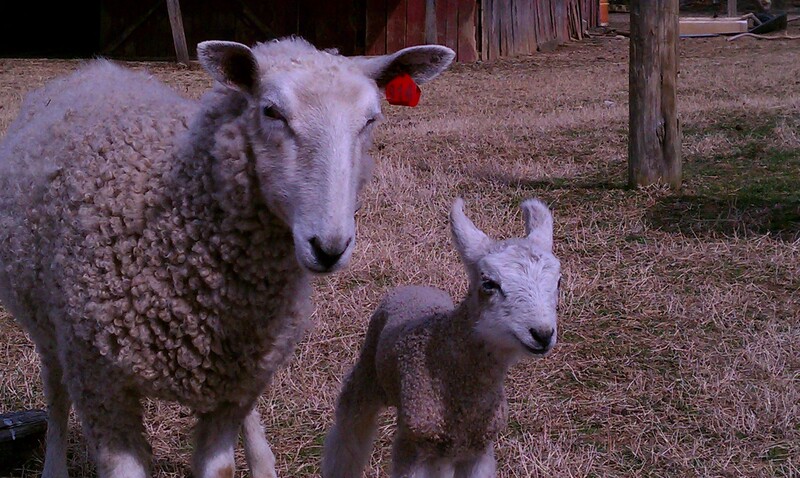 Early Spring brought us the joys of lamb and kid births. So many little ones making it exciting and a little confusing too. We almost lost one of our ewes at lambing. Seems her little (gigantic) lamb didn’t want to come out easily and then we discovered she had been physically exhausted to the point that she gave up. We are very happy to say, she is doing fantastic now and so is “Wil” her lamb. Then there was “Bella”! She was not really a surprise but I had miscalculated her due date of arrival. She and her Mom “Barga” are doing very well. 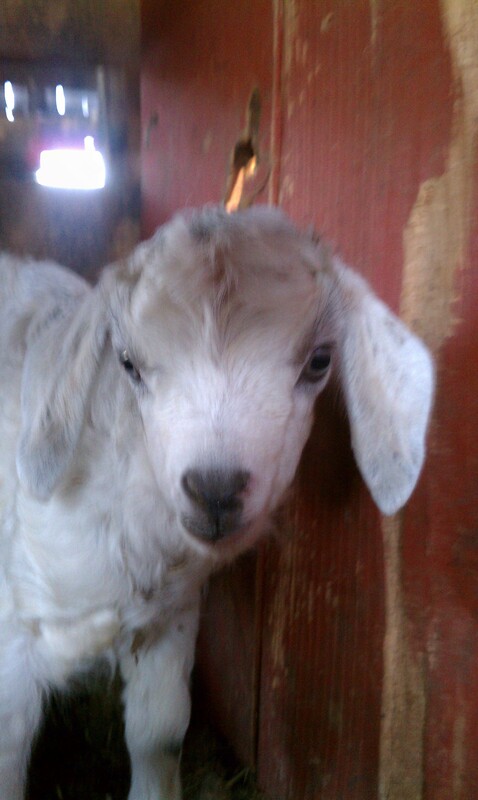 The breeding that produced her was very accidental, which has now led to a 3/4 Angora x 1/4 Alpine Dairy kid. Her fiber is glorious! 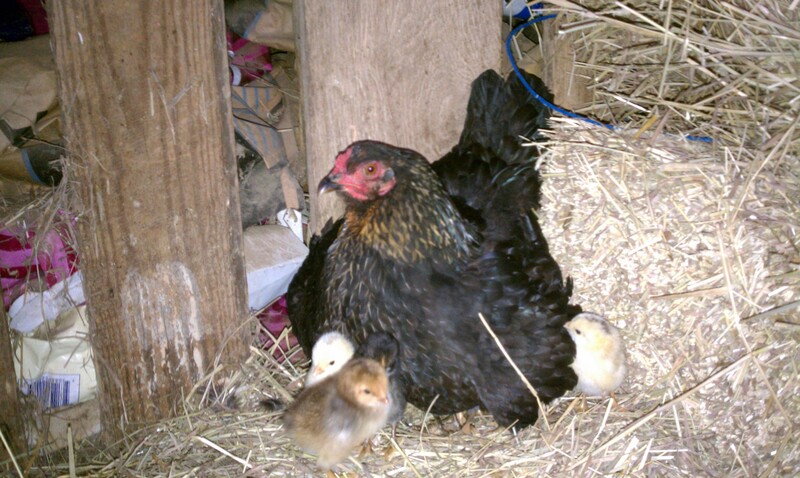 We had a broody hen hatch 13 eggs and have 12, 3 month old chicks now. We have since hatched another 11 chicks which are growing strong..and to our surprise, some of them are actually HENS! 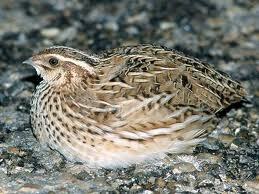 The most exciting addition we’ve made to the farm this Spring are our Coturnix Quail. With the chickens, ducks and now quail we are rapidly becoming an “Egg Farm”. These quail are actually mature and laying eggs within 8 weeks from their hatching and the health benefits from eating their eggs is amazing. There are now 36 of these little ones here and growing. This is the first week we’ve listed their eggs on our local co-op. Aside from all of this we’ve just been working on the farm. Cleaning, growing, painting, sheep shearing and more. Since the loss of Mom, I feel like I’ve been spending a lot of my time recreating pretty much my whole life (not just the farm). I am devoting much more of my time to the sheep and working again with fiber. We are working on a Virginia Grown/USA Grown organic yarn line as well as a line of naturally dyed yarns. Both of these projects are slow moving as it is quite expensive to have all of the fiber processed and natural dying can also be very expensive. Another thing I am doing is participating in special events to share (and sell) our fibers grown here on the farm. Well here I am starting our New Year! Not bad..only 11 or so days into the year. Guess the way 2010 ended for us makes this acceptable. You know I read a lot of different Blogs every week. Some of those that I really like are listed in my sidebar (need to update). Many of those Blogs are about the day to day on the farm. Some are farm stories. I have a passion for anything vintage, so I do follow many of these Blogs too. I wish I had more time to read but fortunately, I am too busy! I did, however, notice on one Blog that I follow that the writer shares with her readers “things you don’t know about her” and I find that I like that idea a lot. So, I thought I’d give it a try myself and share 5 things that you don’t know about me. 1. I am a very kind and giving person. Sometimes to the point that I give and have it taken. 2. I love to read..no matter the subject. Classics, reference, trash romance, picture books, magazines, everything. 3. I like Farmer’s and farm business owners who are real, not frauds. People who really do their own work and get their hands dirty, who honestly do spend the night in a freezing cold barn with a sick animal – not those who use the one time isolated event as a photo/story op. 4. I love, love, love a newborn lamb! Not having children, I tend to throw around terms like hope and promise when I hold one of our newborns for the first time. 5. Cooking is my heart and soul. From the time I was old enough to stand on a stool and reach my hands into fruitcake batter that my Grandmother was making, I’ve loved to cook. It is the most relaxing thing that I do. After 32 years of marriage, I still cook dinner almost every night for my hubby and me. Apparently he still likes it because he still comes in at night and asks “what’s for dinner” and he doesn’t run away when I tell him!! Of course there are so many more other things you don’t know about me but I have an idea…why don’t you share something that people don’t know about you? It would be fun getting to know each other better. Don’t you agree? What Happened To The Fiber Samples?? Several months ago, I had posted information about fiber blends that I had on the list to offer this year and I’ve been asked by several, who had expressed interest, where are the samples? That’s an excellent question! The fiber is sitting on my front porch waiting for UPS to pick it up to send to the processor. In all of the craziness with Mom’s illness, general farm stuff..I forgot to pack up the fiber and send it. This forgetting thing, no doubt, comes with age! For those who didn’t see or hear what my plans are..here we go. We have approximately 100 Alpaca fleeces (20 of which are black and will not be included in this) in every color available in natural alpaca, 30 sheep fleeces in colors ranging from dark blue silver to white, a fairly large amount of Mohair and a little bit of Cashmere. I have taken 3/4 of all of these fibers and am having them blended and/or variegated, carded into roving, and 3/4 of that spun into yarn (dk weight). I’ve done a bit of this on the drum carder, it’s absolutely beautiful..not sharing a photo because I don’t want to spoil the surprise. I’ve even spun up some and taken it a step further and over dyed a little bit of it. All I can say is “Oh My!”. If you want to get on the waiting list for samples, just email me at breezehillfarm@verizon.net and I’ll add you to the list. According to the processor, we’ve got about a 2 month wait, so by the time it comes in, I get the samples out and you place your orders..it’ll be a great time of year to start thinking about Christmas projects. When Is It Too Much Rain? This has been a burning question for days now. Every time we turn on the news, we see reports about flooding..every time we look out our door, we see flooding. There has to be a point where enough is enough. Our pastures are on the way to lush and green but any grass growth that happens to be under the taller stuff is rotting. Our garden spot is standing in water, not because the drainage is bad but because there is so much water it has no where to go. The sheep and goats are both looking for elevated surfaces to stand on..s.o.p. for a goat but sheep are typically ground dwellers. On the plus side though, all of this moisture is making for an absolutely beautiful Spring. The herbs are growing by leaps and anything that could bloom, is blooming. There are many new Irises showing this year that we’ve never seen before..can’t wait to see what colors they are. For years we have only had one or two little Lilly of The Valley pop up and bloom. The year I’ve counted 68 individual plants coming up. So from the floral garden standpoint..the rains (and snows) have created a beautiful display. Talked to my shearer yesterday and we’re scheduled for shearing in two weeks. I know my girls will be happy when that’s done. Two of my smaller (more Romney) girls were actually walking on their side fleece, so this weekend I trimmed up their sides..the fleeces are really nice. I still think that I’m going to do a “pool it all together” processing this year. Since the Alpaca fleeces that I have are so plentiful and our girls fleeces are looking so great, a blended fiber will be nice and something very different. The end result should give me a lot of fiber to dye, over-dye and leave natural, so keep a look out for those to be listed around May or June. I have several people on a waiting list to get samples and if any of our readers are interested in samples too, just email me or leave a comment. When they’re ready, I’ll email you to get your address. While on the subject of fleeces, all of my little goat crosses (Angora x Alpine) blew their fleeces almost a month early. I wasn’t able to salvage any of it. 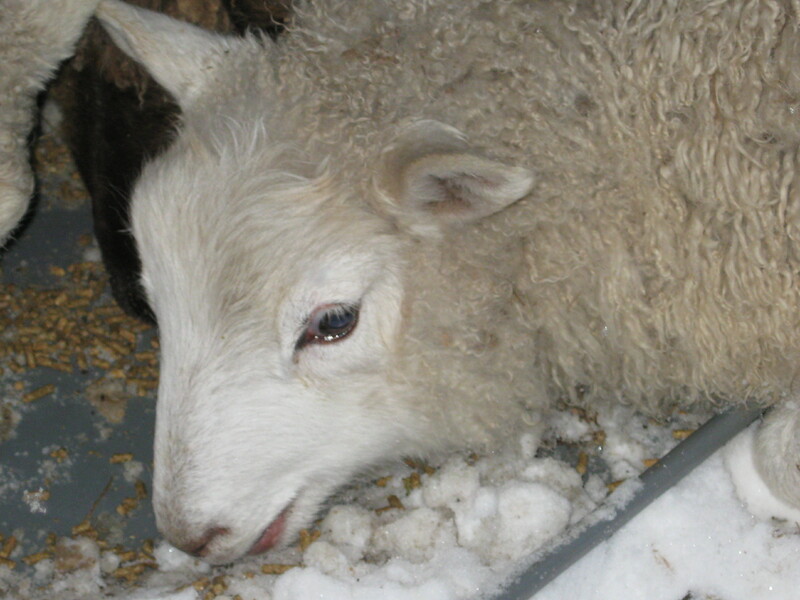 The fleece that they produce is the equivalent of Cashmere with the luster of Mohair. It’s really pretty, takes dye very well and I love to blend it with my white sheep wool..but not this year. Soap update..it’s curing nicely and I should be getting it out to my customers very soon. I have cut back on the variety of fragrances for the time being (until I get orders caught up) and am going to start a Garden Collection of fragrances later in the season. I am still experiencing a hold up on the lotions and butters but hope to get started on those soon. Have a wonderful day and safe day! Working The Farm When You’re Not As Young As You Use To Be! New Year New And Exciting News!! 2012 Where Did It Go? Spring Is In The Air..
Did You Enjoy My Blog? Would You Like To Be Notified When I Make A New Post?